According to the humor theory of Traditional Uighur Medicine (TUM), a same disease is classified into different abnormal humor types and corresponding methods are applied to treat the diseases according to the type of abnormal humor characteristics. To date the biological foundation of classification of diseases by humor theory has been little studied and the mechanism of action is still unclear. In the present study, we aimed to investigate the association between some related gene polymorphisms and depression with abnormal humor in TUM. 201 cases of depression patients in a Uighur population were divided into two groups as: 107 cases of depression patients with abnormal black bile (ABB), 94 cases of depression patients with none abnormal black bile (nABB), and 50 healthy people were served as control group. Venous blood was used to isolate DNA samples, and the polymerase chain reaction-restriction fragment length polymorphism (PCR-RFLP) technique was used for genotyping of single nucleotide polymorphisms (SNPs). Polymorphisms in the serotonin 2A (5-HT2A) receptor gene, brain derived neurotrophic factor (BDNF), serotonin 1A (5-HT1A) receptor gene were investigated in each groups, respectively. The 5-HT2A A-1438G, 5-HT2A T102C, BDNF Val66Met, and 5-HT1A C-1019G gene polymorphisms showed significant association with ABB. However, no difference between nABB and controls was found for those genotype distribution and allele frequency. Moreover, the T102C and A1438G SNPs in the 5-HT2A receptor gene polymorphisms were in linkage disequilibrium. In addition, the OR associated with the combination of Val66Met-Val/Val genotype plus the presence of -1019C allele was 8.393 for ABB compared with controls (OR 8.393; 95% CI 1.807 ~ 38.991; P= 0.003). Moreover, the OR associated with the presence of -Met plus -1019C alleles was 12.194 for ABB compared with controls (OR 12.194; 95% CI 1.433 ~ 103.776; P= 0.005). The OR associated with the presence of -1438C/C plus Val/Val genotypes was 7.738 for ABB compared with controls (OR 7.738; 95% CI 1.566 ~ 38.241; P= 0.005). It was concluded that there were significant relationship between the gene polymorphisms and classification of depression with abnormal humor in TUM. The 5-HT2A A-1438G, 5-HT2A T102C, BDNF Val66Met, and 5-HT1A C-1019G gene polymorphisms might predict the incidence of depression with ABB. Depression is a major public health problem. It tends to have a chronic course, produces disability and is associated with suicide [1, 2]. There are overwhelming justifications to explore the molecular mechanisms underlying major depressive disorder , depression significantly complicates chronic illness  and depression is the leading cause of disability worldwide . The disease of depression or melancholy (black bile in Greek) was linked to the Hippocratic/Galenic medical theory of the four humors. Humoral Theory was initially Greek philosophy and firstly brought to medicine by Hippocrates (c.460-370 B.C. ), adopted and developed by Greek (e.g. Galen, c.129-216 A.D.), Roman and Islamic physicians (e.g. Avicenna, c.980-1037 A.D.), it became the most commonly held view of the human body among European physicians until the discoveries of the functions of the circulatory, respiratory and digestive systems in 18th century. Essentially, this theory holds that human body was filled with four basic substances or humors- blood, phlegm, yellow bile and black bile. According to Hippocrates Medicine, the four humors needed to be balanced for good health, and an excess or deficit of one of these humors would disrupt the balance of these humors and cause disease . “Abnormal black bile” is the term for an excess of black bile (literally “savda” in Arabic) and Melancholia or Depression was thought to be caused by “Abnormal black bile” by Galen which was adopted by Avicenna [7, 8]. Although existence of black bile or abnormal black bile in body has never been confirmed in modern research, the demonstrated symptoms and signs of abnormal black bile were described in detail in Cannon of Medicine by Avicenna . Although the four humors theory was dismantled from 19th century, the definitive methods of Hippocratic medicine clinical diagnostics of abnormal humors have survived intact in the medical system of Uighur people in China. Traditional Uighur Medicine (TUM) considers the unbalanced humors or abnormal changes of humors are thought to cause disorders or diseases, and most clinical works identified the cause of complex diseases such as cancer, depression as an excess of black bile [10–12]., and some researches even indicate patients with “abnormal black bile” were significantly different from those with “non-abnormal black bile” (abnormal blood, yellow bile and phlegm) in terms of gene polymorphism, pre-thrombotic state and oxidative stress [13–15]. However, is “abnormal black bile” an existing phenomenon with distinct biological basis or merely imaginary philosophical concept that causes Depression? We undertook this investigation to answer this question. The 5-HT2A receptor is widely distributed in the central nervous system and periphery, and associated with major depressive illness . Two single nucleotide polymorphisms, A-1438G and T102C are common in the population, show strong linkage disequilibrium with depression, and are associated with efficacy and positive side effect profiles of anti-depressant medications in some studies [17–20]. The 5-HT1A receptor is a key mediator of serotonergic signaling in the central nervous system, and known as the major autoreceptor of serotonergic raphe neurons . The C-1019G polymorphism of the 5-HT1A gene promoter polymorphism affects 5-HT1A receptor binding potential and protein expression . Several studies suggest that GG genotype or G allele carriers of the 5-HT1A gene promoter polymorphism have a greater risk of depression and poorer response to antidepressant therapy [18, 22]. Brain-derived neurotrophic factor (BDNF) plays a critical role in neuronal growth, survival and differentiation neuronal cells of the central nervous system . There is increasing evidence that the BDNF might be one of the relevant factors in the pathophysiology of depression . Evidence of an association between the BDNF Val66Met polymorphism and depression is rapidly being replicated . In the present study, we investigated the 5-HT2A T102C, 5-HT2A A-1438G, BDNF Val66Met and 5-HT1A C-1019G gene polymorphisms in depression patients with two type of abnormal humor in TUM. Some of these gene polymorphisms have been thoroughly studied, but to our knowledge this is the first study to investigate the association of multiple polymorphisms and depression with abnormal humor in TUM. Our purpose was to investigate the association between some related gene polymorphisms and depression with abnormal humor, and whether certain genetic polymorphisms may be predictive markers of depression in patients with abnormal humor in TUM. Patients including in this study met standards both of Western medicine and Traditional Uighur medicine. Specially, we followed the following criteria: (a) Uighur ethnic group, (b) aged 14 to 80 years, (c) meet the Mood disorder standard of Chinese Classification of Mental Disorders (CCMD-3), (d) the Hamilton Rating Scale for Depression (HAMD) 24-item version scale score ≥ 18, (e) patients or their parents gave informed consent for this study, and (f) there were no restrictions on gender. We excluded patients: (a) with cerebrovascular disease or other serious organic brain diseases, (b) with high blood pressure, diabetes and other serious physical illness, (c) with other mental disorders associated with depression, (d) who has a history of manic episodes or anti-depressant induced mania, (e) who recently (within six weeks) received anti-depressant treatment. We selected 201 patients of Uighur population who were diagnosed by two independent psychiatrists respectively (134 females and 67 males mean age 42.57 ± 15.64 years). While 50 healthy volunteers were used as controls (20 females and 30 males with a mean age of 28 ± 8.56 years). The research protocol was approved by the First Affiliated Hospital (First Affiliated Hospital, Xinjiang Medical University, Urumqi, China) ethics review committee. Written informed consent was obtained from each subject prior to the study. 201 cases of depression patients were classified into abnormal black bile (ABB) group and none abnormal black bile (nABB) group according to humor classification criteria described in TUM [9, 10]. The ABB group consisted of 72 females and 35 males with a mean age of 44.19 ± 15.43 years and with a mean HAMD score of 37.92 ± 11.53. The nABB group consisted of 62 females and 32 males with a mean age of 40.65 ± 16.68 years and with a mean HAMD score of 38.42 ± 13.59. After 12 hours of fasting, 4 ml of venous blood was collected from each subject in 0.019 mol/L sodium citrate (1 portion anticoagulant + 9 portion whole blood). DNA was extracted from blood leukocytes with the TIANamp Blood DNA Kit (TIANGEN BIOTECH, Beijing). To genotype the A-1438G SNP in the 5-HT2A gene, PCR was performed with the forward primer 5′-CTAGCCACCCTGAGCCTATG-3′ and the reverse primer 5′-TTGTGCAGATTCCCATTAAGG-3′. The amplification mixture contained 2 μl of 100 ng/μl DNA, 10 μl of 2 × Master Mix (2 × Taq PCR Master Mix, TIANGEN), 0.5 μl of 20 μM each primer, 7 μl of distilled water in a final volume of 20 μl. The amplification cycle was performed on a C1000™ Thermal Cycler (BIO-RAD, USA). After an initial denaturation at 94°C for 3 min, the DNA was amplified by 35 PCR cycles: denaturation at 94°C for 30 s, annealing at 58.1°C for 30 s and extension at 72°C for 1 min, followed by a final extension at 72°C for 7 min, and the reaction was terminated at 4°C. Amplified products were separated by electrophoresis on 1.5% agarose gel and visualized with ultraviolet light after ethidium bromide staining. The 2 × Master Mix contained 10 mM Tris–HCl (PH8.3), 100 mM KCl, 3 mM MgCl2, 500 μM dNTP each, 0.1 U Taq Polymerase/μl. The amplified DNA was digested at 37°C for 12 hours with the restriction enzyme MspI (Fermentas, USA), which cuts at the 1438G site. The product was electrophoresed on 3% agarose gels and stained with ethidium bromide. Homozygous genotypes were identified by the presence of a single 200-bp band (AA), or bands of 121- and 79-bp (GG). The heterozygous genotype (AG) had all three bands. To genotype the T102C SNP in the 5-HT2A gene, PCR was performed with the forward primer 5′-TCTGCTACAAGTTCTGGCTT-3′ and the reverse primer 5′-CTGCAGCTTTTTCTCTAGGG-3′ . Amplification was performed using the same methods described for the 5-HT2A A-1438G SNP. Allele 1 (T102-allele) was represented by the uncut 342-bp PCR product and allele 2 (C102-allele) consisted of two fragments at 217- and 125-bp. The genotyping of Val66Met polymorphism of the BDNF gene was determined by examining the occurrence of a NlaIII recognition site . The PCR assay mixture contained 2 μl of 100 ng/μl DNA, 10 μl of 2 × Master Mix (2 × Taq PCR Master Mix, TIANGEN), 0.5 μl of 20 μM each primer (5′-ACTCTGGAGAGCGTGAAT-3′ and 5′-ATACTGTCACACACGCTC-3′) , and 7 μl of distilled water. The amplification cycle was performed on a C1000™ Thermal Cycler (BIO-RAD, USA). After an initial denaturation at 94°C for 5 min, the DNA was amplified by 35 cycles: denaturation at 94°C for 30 s, annealing 60°C for 30 s and extension 72°C for 1 min, followed by a final extension at 72°C for 7 min, the reaction was terminated at 4°C. PCR products were digested with NlaIII (Fermentas, USA) endonuclease, the product was electrophoresed on 3% agarose gels and stained with ethidium bromide. The presence of 168 and 75 bp bands indicates the existence of A (Met) allele; the presence of 243 bp band indicates the existence of G (Val) allele, while the presence of 75, 168 and 243 bp indicates AG (Met/Val) heterozygote. To genotype the C-1019G SNP in the 5-HT1A gene, PCR was performed with the forward primer 5′-TGGAAGAAGACCGAGTGTGTCTAC-3′ and the reverse primer 5′-TTCTCCCTGAGGGAGTAAGGCTGG-3′ . The amplification mixture contained 2 μl of 100 ng/μl DNA, 10 μl of 2 × Master Mix (2 × Taq PCR Master Mix, TIANGEN), 0.5 μl of 20 μM each primer and 7 μl of distilled water. Samples were amplified using a C1000™ Thermal Cycler (BIO-RAD, USA) for 36 cycles. After an initial 5 min at 95°C, each cycle consisted of 45 s at 95°C, 45 s at 56°C, and 45 s at 72°C. After a final 10 min at 72°C, the reaction was terminated at 4°C. The amplified DNA was digested with the restriction enzyme Hpy CH4IV (Fermentas, USA ), which cuts at the -1019G site, and the product was electrophoresed in 5% agarose gels and stained with ethidium bromide. Homozygous genotypes were identified by the presence of a single 182 bp band (C/C), or bands of 158 and 24 bp (G/G). The heterozygous genotype had three bands: 182, 158, and 24 bp (C/G). Data was analyzed using the statistical package for social sciences (SPSS ver.17). Quantitative variables were expressed as mean ± SD. Differences in variable means between ABB group and nABB group were compared by T test. Reported percentages reflect average values. Alleles, genotype frequencies, and individual features between patients and control subjects were compared by Pearson Chi-Square (χ2) and Continuity Correction Chi-Square test. Hardy-Weinberg equilibrium was assessed by Chi-Square analysis. A P value less than 0.05 was considered statistically significant. Homozygous genotypes were identified by the presence of a single 200-bp band (AA) or bands of 121- and 79-bp (GG). The heterozygous type (AG) displayed all three band sizes (Figure 1). Agarose gel eletrophoretogram of 5-HT 2A A-1438G PCR product after digestion with MspI. The distribution of the A-1438G polymorphism of 5-HT2A in nABB group and control group were in agreement with the Hardy-Weinberg equilibrium. There were no significant differences between groups (P > 0.05). Lane M1: 50 bp DNA Ladder; Lane A, D, and G: AA; Lane B, E, and H: GG; Lane C, F, and I: AG; Lane M2: 2000 bp DNA marker. The distribution of the A-1438G polymorphism of 5-HT2A in nABB group and control group were in agreement with the Hardy-Weinberg equilibrium. There were no significant differences between groups (P > 0.05). The Hardy-Weinberg equilibria for the candidate gene were as follows: nABB group, χ2= 0.095, df= 2, P= 0.954; control group, χ2= 0.665, df= 2, P= 0.717. Frequencies of 5-HT2A A-1438G alleles and genotypes in the ABB group, nABB group and control group are shown in Table 1. There were significant differences in the 5-HT2A A-1438G genotype distributions among the ABB group,nABB group and control group (χ2= 13.310, P= 0.010). Compared with the control and nABB groups, the ABB group had significant differences (χ2= 12.760, P= 0.002; χ2= 8.299, P= 0.016) in the A-1438G genotype distributions. Compared to control group, the nABB group had not a significant difference in the A-1438G genotype distributions (P > 0.05). Individuals with the GG (OR 0.176; 95% CI 0.057 ~ 0.538) genotypes were more likely to not have depression. Moreover, GG genotype seemed to be protective factor. There were no significant differences in the 5-HT2A A-1438G allele distributions among the ABB group,nABB group and control group (χ2= 1.904, P= 0.386). aOdds ratio (and 95% confidence interval) for GG vs (A/G + A/A) is 0.176(0.057 ~ 0.538), χ2= 11.O25, df= 1, P= 0.001.
bOdds ratio (and 95% confidence interval) for CC vs (T/C + T/T) is 0.139(0.042 ~ 0.463), χ2= 12.987, df= 1, P= 0.000.
cOdds ratio (and 95% confidence interval) for Val/Val vs (Val/Met + Met/Met) is 2.936(1.383 ~ 6.232), χ2= 8.205, df= 1, P= 0.004, and Met/Met vs Val/Met + Val/Val is 0.124(0.038 ~ 0.409), χ2= 15.100, df= 1, P= 0.000.
dOdds ratio (and 95% confidence interval) for Met allele vs Val allele is 2.936(1.383 ~ 6.232), χ2= 14.692, df= 1, P= 0.000.
eOdds ratio (and 95% confidence interval) for GG vs (G/C + C/C) is 0.157(0.052 ~ 0.475), χ2= 13.010, df= 1, P= 0.000.
fOdds ratio (and 95% confidence interval) for C allele vs G allele is 2.006(1.229 ~ 3.271), χ2= 7.884, df= 1, P= 0.005. Homozygous genotypes were identified by the presence of a single 342-bp band (TT), or bands of 217- and 125-bp (CC). The heterozygous genotype (TC) had all three bands (Figure 2). Agarose gel eletrophoretogram of 5-HT 2A T102C PCR product after digestion with MspI. The distribution of the 5-HT2A T102C polymorphism in nABB group and control group were in agreement with the Hardy-Weinberg equilibrium. There were no significant differences between groups (P > 0.05). Lane M1: 2000 bp DNA marker; Lane A, D, and G: TT; Lane B, E, and H: CC; Lane C, F, and I: TC; Lane M2: 50 bp DNA Ladder. The distribution of the 5-HT2A T102C polymorphism in nABB group and control group were in agreement with the Hardy-Weinberg equilibrium. There were no significant differences between groups (P > 0.05).The Hardy-Weinberg equilibria for the candidate gene were as follows: nABB group χ2= 0.096 df= 2 P= 0.953; control group χ2= 0.675 df= 2 P= 0.714. Frequencies of the 5-HT2A T102C alleles and genotypes in the ABB group, nABB group and control group are shown in Table 1. There were significant statistical differences in the 5-HT2A T102C genotype distributions among the ABB group, nABB group, and control group (χ2= 15.686, P= 0.003). Compared with the control and nABB groups, the ABB group had significant differences (χ2= 15.602, P= 0.000; χ2= 9.074, P= 0.011) in the T102C genotype distributions. Compared to control group, the nABB group had not a significant difference (P > 0.05) in the T102C genotype distributions. Individuals with the CC (OR 0.139; 95% CI 0.042 ~ 0.463) genotypes were more likely to not have depression. Moreover, CC genotype seemed to be protective factor. There were no significant differences in the 5-HT2A T102C allele distributions among the ABB,nABB and control group (χ2= 1.566, P= 0.457). Homozygous genotypes were identified by the presence of a single 243-bp band (Val/Val), or bands of 75- and 168-bp (Met/Met). The heterozygous genotype (Met/Val) had all three bands (Figure 3). Agarose gel eletrophoretogram of BDNF Val66Met PCR product after digestion with NlaIII. The distribution of the BDNF Val66Met polymorphism in the ABB group, nABB group and control group were in agreement with the Hardy-Weinberg equilibrium. There were no significant differences between groups (P > 0.05). Lane M1: 50 bp DNA Ladder; Lane A, D, and G: Val/Val; Lane B, E, and H: Met/Met; Lane C, F, and I: Met/Val; Lane M2: 50 bp DNA Ladder. The distribution of the BDNF Val66Met polymorphism in the ABB group, nABB group and control group were in agreement with the Hardy-Weinberg equilibrium. There were no significant differences between groups (P > 0.05). The Hardy-Weinberg equilibria for the candidate gene were as follows: ABB group, χ2= 2.165,df= 2, P= 0.339; nABB group, χ2= 0.006,df= 2, P= 0.997; control group, χ2= 0.090,df= 2, P= 0.956. The genotype and allele frequency distributions of BDNF Val66Met polymorphism in patients and control subjects is shown in Table 1. There were significant statistical differences in the BDNF Val66Met genotype distributions among the ABB group, nABB group, and control group (χ2= 17.793, P= 0.001). Compared with the control and nABB groups, the ABB group had significant differences (χ2= 6.414, P= 0.040; χ2= 18.547, P= 0.000) in the BDNF Val66Met genotype distributions. Compared to control group, the nABB group had not a significant difference (P > 0.05) in the Val66Met genotype distributions. Individuals with the Met/Met (OR 0.124; 95% CI 0.038 ~ 0.409) genotypes were more likely to not have depression. Moreover, Met/Met genotype seemed to be protective factor. In case of the genotypic association of BDNF, analyses using the recessive model showed association between the SNP and the risk of depression (χ2= 8.205,P= 0.004). Individuals with the Met allele more likely to be have depression (OR 2.936; 95% CI 1.383 ~ 6.232 for the recessive model). There were significant differences in the BDNF Val66Met allele distributions among the ABB,nABB and control group (χ2= 14.773, P= 0.001). Homozygous genotypes were identified by the presence of a single 182-bp band (C/C), or bands of 24- and 158-bp (G/G). 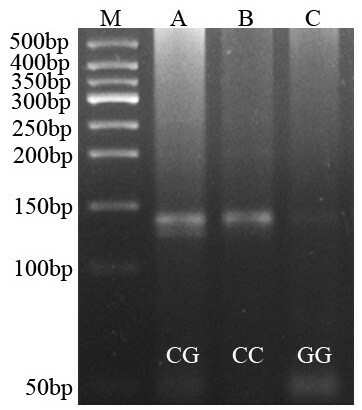 The heterozygous genotype (C/G) had all three bands (Figure 4). Agarose gel eletrophoretogram of 5-HT 1A C-1019G PCR product after digestion with Hpy CH4IV. The distribution of the 5-HT1A C-1019G polymorphism in the ABB group, nABB group and control group were in agreement with the Hardy-Weinberg equilibrium. There were no significant differences between groups (P > 0.05). Lane M: 50 bp DNA Ladder; Lane A: CG; Lane B: CC; Lane C: GG. The distribution of the 5-HT1A C-1019G polymorphism in the ABB group, nABB group and control group were in agreement with the Hardy-Weinberg equilibrium. There were no significant differences between groups (P > 0.05). The Hardy-Weinberg equilibria for the candidate gene were as follows: ABB group, χ2= 2.924,df= 2, P= 0.232; nABB group, χ2= 0.951,df= 2, P= 0.622; control group, χ2= 0.161,df= 2, P= 0.923. The genotype and allele frequency distribution of 5-HT1A C-1019G polymorphism in patients and control subjects is shown in Table 1. There were significant statistical differences in the 5-HT1A C-1019G genotype distributions among the ABB group, nABB group, and control group (χ2= 14.633, P= 0.006). Compared with the control and nABB groups, the ABB group had significant differences (χ2= 7.703, P= 0.021; χ2= 13.387, P= 0.001) in the 5-HT1A C-1019G genotype distributions. Compared to the control group, the nABB group had not significant differences (P > 0.05) in the 5-HT1A C-1019G genotype distributions. Individuals with the GG (OR 0.157; 95% CI 0.052 ~ 0.475) genotypes were more likely to not have depression. Moreover, GG genotype seemed to be protective factor. There were significant differences in the 5-HT1A C-1019G allele distributions among the ABB,nABB and control group (χ2= 7.914, P= 0.019). The two polymorphisms were in linkage disequilibrium. Table 2 shows that 93.3% of ABB and 78.0% of controls homozygous for 102 T were also homozygous for -1438A. In addition, 65.1% of ABB and 62.0% of controls homozygous for 102C were also homozygous for -1438G allele. The -1438A and 102 T allele frequencies were higher among ABB (0.64 and 0.64, respectively) than in controls (0.57 and 0.58, respectively). The OR associated with the presence of -1438A plus 102 T alleles was 3.989 for ABB compared with controls (OR 3.989; 95% CI 1.442 ~ 11.035; P= 0.005) (Table 2). Significant difference was observed between the ABB and control groups (χ2= 14.692,P= 0.000) in the BDNF Val66Met allele distribution. The Val allele was associated with 2.593 fold increased risk for depression compared with Met allele (OR 2.593; 95% CI 1.583 ~ 4.249). Moreover, there was a significant difference in the 5-HT1A C-1019G allele distribution between the ABB and control groups (χ2= 7.884,P= 0.005). The C allele was associated with 2.006 fold increased risk for depression compared with G allele (OR 2.006; 95% CI 1.229 ~ 3.271). The OR associated with the combination of Val66Met-Val/Val genotype plus the presence of -1019C allele was 8.393 for ABB compared with controls (OR 8.393; 95% CI 1.807 ~ 38.991; P= 0.003). Moreover, the OR associated with the presence of -Met plus -1019C alleles was 12.194 for ABB compared with controls (OR 12.194; 95% CI 1.433 ~ 103.776; P= 0.005). The OR associated with the presence of -1438C/C plus Val/Val genotypes was 7.738 for ABB compared with controls (OR 7.738; 95% CI 1.566 ~ 38.241; P= 0.005) (Table 3). Table 4 presents the estimated logistic regression coefficients, estimated SEs, adjusted odds ratios (ORs), and 95% confidence intervals (CIs) for the adjusted ORs for the final model for admissions. After adjusting for those conventional depression risk factors such as age, gender, the AA (of the A-1438G polymorphisms of the 5-HT2A gene), Val/Val (of the Val66Met polymorphisms of the BDNF gene), CC (of the C-1019G polymorphisms of the 5-HT1A gene) genotype still had an approximately. A multiple logistic regression model showed 5 independent factors: Gender (OR= 0.365, 95% CI: 0.136-0.982; P < 0.05), Age (OR= 4.806, 95% CI: 2.476-9.328; P < 0.01), AA (OR=13.759, 95% CI: 2.225-85.076; P <005; for 5-HT2A A-1438G), Val/Val (OR= 39.791, 95% CI: 5.365-295.110; P <0.01), CC (OR= 7.309, 95% CI: 1.349-39.597; P <0.05; for 5-HT1A C-1019G). In addition, we found Val/Met genotype of the BDNF Val66Met gene is also an independent risk factor for ABB with an odds ratio of 6.854-fold higher relative risk of developing ABB than those with the Met/Met homozygote (OR= 6.854, 95% CI: 1.092-43.033; P < 0.05), also AG (OR=32.889, 95% CI: 4.981-217.178; P < 0.01; for 5-HT2A A-1438G) and CG (OR= 7.420, 95% CI: 1.282-42.965; P < 0.05; for 5-HT1A C-1019G) genotypes are an independent risk factor for ABB. Traditional Uighur Medicine (TUM), a well-known medical system in China for their remarkable curative effect, is based on the concept of equilibrium and balance of natural body humors (blood, phlegm, yellow bile, and black bile). The imbalance in the quality and quantity of these humors leads to diseases whereas restoration of this balance maintains health of a person . Abnormal humors include abnormal blood, abnormal phlegm, abnormal yellow bile and abnormal black bile. According to TUM, abnormal black bile is a special humor in the body, and is the main cause of complex diseases such as tumors, diabetes mellitus, hypertension, and depression . In this study, we evaluated the individual and interaction effects of depression related gene polymorphisms in depression with abnormal humor. Our results indicated that there were significant interactions of the T102C and A1438G SNPs in 5-HT2A receptor gene, Val66Met SNP in BDNF gene, and C-1019G SNP in 5-HT1A receptor gene with depression with abnormal humor. Moreover, the present study showed a significant interaction between the BDNF Val66Met and 5-HT1A C-1019G polymorphisms. The present study on ABB revealed significant difference in the prevalence of 5-HT2A T102C and 5-HT2A A-1438G genotype frequency compared with that of controls and nABB patients. These results reported here in a Chinese population were not in agreement with those reported by Dawei Li, who found no association of the T102C polymorphism with either schizophrenia or suicidal behavior, evidence of significant association was only detected between the A-1438G polymorphism and suicidal behavior . Our results failed to confirm previous reports that genotype frequencies of 102 T/C 5-HT2A receptor gene polymorphism in mood disorders do not differ from healthy volunteers [31–33]. Moreover, Ho-kyoung Yoon concluded that the 5-HT2A T102C polymorphism may not be associated with susceptibility to suicidal behavior in Korean population . We postulate that the differences in the genotype frequencies between our study and previous reports may be the result of ethnic differences of patients participated in these studies. Furthermore, no difference was found in 5-HT2A T102C genotype and allele distribution between the mood disordered subjects, with and without suicide attempt history, and controls . The authors concluded that their study did not support the association of the 5-HT2A gene with either schizophrenia or suicidal behavior. The results showed a higher frequency of 5-HT2A –1438A and 102 T alleles in ABB compared to controls. We found that the 1438G, 102 T alleles and the homozygosity for these alleles were significantly more frequent among the patients with ABB than among the controls, suggesting that the allele is associated with susceptibility to depression. We also found that AA (or TT) genotype is an independent risk factor for ABB according to the multiple logistic regression models. In this study, we found a significant difference among the Val/Val, Val/Met, and Met/Met genotypes or between Val and Met alleles in ABB group patients compared with the controls and nABB patients. Our results reported here in a Chinese population are in agreement with those reports such as BDNF may have a major role in the pathogenesis and treatment response of depression . Two meta-analyses have suggested that BDNF is associated with depression or the response to antidepressants [37, 38], while another meta-analysis showed no association . In this study, ABB individuals with the major allele (Val/Val) had an odds ratio of 2.9, also Val/Val genotype is an independent risk factor for ABB according to the multiple logistic regression models. Our results confirmed previous reports that BDNF polymorphism is associated with increased risk of depression in some studies [40, 41], as some studies found no association [18, 42–44]. In our study Val allele has a higher distribution in the Chinese population, and Val/Val genotype or carrying Val allele of BDNF Val66Met polymorphism is associated with higher response to depression. Approximately 30%-50% of people worldwide are either heterozygous (Val/Met) or homozygous (Met/Met) for the methionine substitution . Although there is a wealth of information about individuals heterozygous for the Met polymorphism, little information exists about individuals who are homozygous for the Met allele (Met/Met), because this genotype is rare in the general population, comprising only 4% of people in the United States . In studies of brain morphometry using structural MRI scans, Val/Met individuals have repeatedly been shown to have a smaller hippocampal volume relative to controls to who are homozygous for the Val allele (Val/Val) [46, 47]. This difference may be related to the role BDNF and its receptors play in the development as well as continued plasticity of the brain [48, 49]. In this study, we found a significant difference between 5-HT1A gene CC, CG, and GG genotype or between C and G allele in ABB group patients compared with the controls and nABB patients. We found that the CC allele and the homozygosity for this allele were significantly more frequent among the patients with ABB than among the controls, suggesting that the allele is associated with susceptibility to depression. Our results were not in agreement with these reports that GG genotype is associated with increased risk of depression  and suicide . In our study C allele has a higher distribution in the Chinese population, and CC genotype or carrying C allele of 5-HT1A C1019G gene is associated with higher response to depression patients with abnormal humor syndrome. We also found that ABB individuals with the major allele (CC) had an odd ratio of 1.8; CC genotype is an independent risk factor for ABB according to the multiple logistic regression models. In the present study, subjects carrying both 5-HT1A C1019G polymorphism CC genotype and Val/Val genotype of BDNF Val66Met polymorphism had over seven times higher risk of depression than those who did not have this combination of polymorphisms. We reported a significant association between combined polymorphisms of 5-HT1A and BDNF polymorphisms and our result was in line with earlier reports . In summary, the present study demonstrated that the A-1438 and T102C polymorphisms of the 5-HT2A receptor gene, BDNF Val66Met, and 5-HT1A C-1019G might predict the incidence of depression induced by abnormal black bile. The results showed a higher frequency of 5-HT2A –1438A and 102 T alleles. 5-HT2A –1438A and 102 T polymorphisms were in linkage disequilibrium. ABB individuals with the major allele (Val/Val) had a three times of odds ratio, also ABB individuals with the major allele (CC) had a two times of odds ratio. The AA, Val/Val, and CC genotypes were independent risk factors for the ABB. There was a significant association between combined polymorphisms of 5-HT1A and BDNF polymorphisms. However, it was the first study to investigate the association of multiple gene polymorphisms and depression with abnormal humor in TUM. Of course, as an ancient medical system, principles of TUM classification of depression contain a variety of biological foundation. But the present study at least to provide new ideas for individualized diagnosis, prevention, treatment of depression. It was concluded that there were significant relationship between the gene polymorphisms and classification of depression with abnormal humor in TUM. The 5-HT2A A-1438G, 5-HT2A T102C, BDNF Val66Met, and 5-HT1A C-1019G gene polymorphisms might predict the incidence of depression with ABB. It was the first study to investigate the association of multiple gene polymorphisms and depression with abnormal humor in TUM. Of course, as an ancient medical system, principles of TUM classification of depression contain a variety of biological foundation. But the present study at least to provide new ideas for individualized diagnosis, prevention, treatment of depression. Abdiryim Yusup and Halmurat Upur contributed equally to this work. Hamilton rating scale for depression. The present study was supported by the National Natural Science Foundation of China (No: 81360667) and by a research grant for Yangtze River scholar, Ministry of Education of the People’s Republic of China (No: IRT0977). AY designed the study. HU performed genotyping, made statistical analysis, managed literature search, interpreted the data and wrote the manuscript. AA collected samples. HU (corresponding author) gave comments to the manuscript. All authors read and approved the final manuscript.